Despite these unimpressive sales, enthusiasts argue that the electric future is inevitable, driven by ever-cheaper batteries and consumer interest. But we've seen such predictions of unbridled optimism before for several alternative fuel visions —all followed by periods of unmet expectations and disappointment. 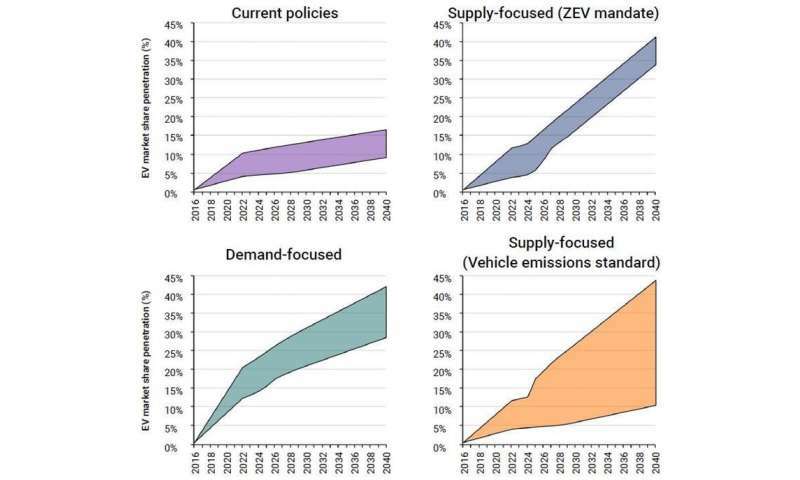 To help inform this strategy and the Canadian public, my research team at Simon Fraser University, supported by the Metcalf Foundation, has this month released Canada's ZEV Policy Handbook. This report builds off of our 2016 EV Policy Report, which found that no part of Canada was on its way to meet long-term EV sales goals. Our new handbook provides a toolbox to get us on track. My team's published research shows that some of the biggest barriers to EV sales are a lack of supply, limited availability and variety of EV makes and models, and limitations in charging infrastructure. The only thing that can overcome these barriers is public policy. All of the improvements in cars and trucks over the last century, be they safety, environmental or otherwise, can be linked directly to policy. Seat belts, air bags, unleaded gasoline, fuel economy improvements —all came about through strong policy support. The clear champion to date is Norway —no other country comes close. Its approach to passenger vehicles includes a number of complimentary policies —financial subsidies, high-occupancy vehicle (HOV) lane access and deployment of charging infrastructure. But what stands out is the ZEV mandate. 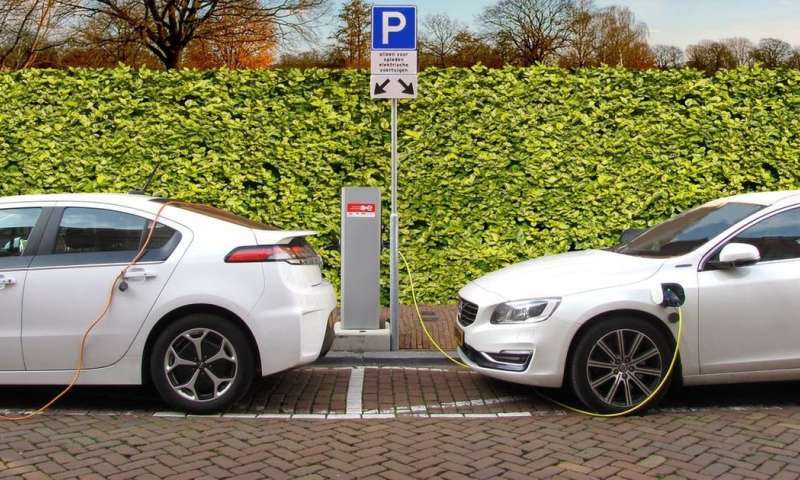 These two leading regions provide two different strategies for EV success. Norway's strategy is largely "demand-focused," using exceptionally large incentives and tax breaks to make EVs more appealing to consumers. California's strategy, on the other hand, focuses more on the supply side, applying a regulation to automakers to channel innovation and marketing strategy. The problem is that current policies in Canada, and most countries globally, are too weak: Short in duration and lacking in "teeth." Many regions offer EV purchase subsidies, but these are too small and temporary to make a noticeable difference in EV sales in the long term. Ontario's purchase incentive is notably large, offering $3,000 to $14,000 for an EV. But because it's not clear if such a policy will be in place for more than a year or two, automakers and other stakeholders don't get a clear signal if EVs really are the future. While both approaches can be successful, they have different strengths and weaknesses. Our handbook compares each policy package across five criteria: Effectiveness, cost-effectiveness for government, political acceptability, complexity and strength of "signal" for transition. However, there is no easy answer for which strategy is best for a given region. Norway and California provide excellent examples of leadership —though each has its own unique cultural and political contexts. Any region, national or subnational, that is serious about supporting EVs will need to consider the trade-offs for themselves. But it's clear that the only way to be successful is to go big: Either implementing large subsidies for a long time, or enacting strong, durable regulation with "teeth." Just get the batteries cheaper and with high capacity. If people have a choice between two EVs at the same price, one ICE and the other with a 500 mile battery range, almost everyone will choose the latter. No laws needed. The lack of supply/variety is on the shoulders of automakers. The lack of infrastructure is not necessarily dependent on policy (see Tesla's supercharger network). That is not to say that public policy can't help. It should certainly be part of the deal (as it has been with all new technologies that are transformative on a society-wide scale). All this will fade into the past when Americans realize the much cheaper cost of the EV in its lifetime, and the almost complete lack of maintenance. Once they drive one, it will be over. We have two. "My team's published research shows that some of the biggest barriers to EV sales are a lack of supply, limited availability and variety of EV makes and models, and limitations in charging infrastructure. The only thing that can overcome these barriers is public policy." Yup the socialist state has proven time and time again that the free market does not work. Should the state make roads more autonomous vehicle friendly by installing guidance devices, yes of course. I am afraid that the state will take the easy way out and promote EV goals by edict and disregard the citizens wishes. The Progressive movement really can't help itself. It feels that normal progress is never enough and that personal freedoms must always be sacrificed in order to obtain the rate of change that it desires. I think MR is correct - many of us would like to see government playing a role in pushing this new tech. It is going to come anyway - but climate change adds a little urgency. The Conservatives are opposed to any government involvement - and would have us all breathing lead, arsenic, etc etc. What a crazy idea - having the government involved in protecting health and safety!!!! "The Conservatives are opposed to any government involvement - and would have us all breathing lead, arsenic, etc etc. What a crazy idea - having the government involved in protecting health and safety!!!!" What a silly post. The EPA was created by President Nixon. Just because a little regulation is good it does not mean that a lot is better. Excess regulation is the difference between freedom and subservience! Yes Onions the definition of excess regulation does separate Progressives from Conservatives. Progressives would much rather err on the side of too much regulation since they do not place much value on individual freedoms and place a lot of value on a strong central government. Here is just one example of how a little is good and a lot is bad. In the US we have regulations concerning development and usage near wetlands (good). If your land has surface water showing for as little as 2 weeks out of an entire year it can be considered wetlands and serious building, usage and plowing restrictions then apply for a large radius around that area (bad). I think that is one small part of the distinction MR - but certainly not the whole thing. But yes - folks on the left see a stronger role for government - in terms things like health, safety, environmental protection. Regarding personal freedom - I think that I had much more personal freedom living in UK - a country that has a much stronger government involvement in most aspects of life. In the UK - you could protest the election of someone you disapproved of - and not fear this kind of government over reach - https://www.alter...s-prison It is conservatives who want to control who I can love, and what I should do in bed, and which bathroom I am allowed to use. You conservatives are the biggest hypocrites - and you don't like technologies that are good for the environment. Onions your example of US violation of freedoms makes little sense. Here in the US we do not consider burning and looting a valid form of protest and when that happens many bystanders will be arrested and we let the courts sort it all out. Also Washington DC is one of the most liberal cities in the US so your example cannot be blamed on conservative values. Finally the so called "Hate Speech" laws in the UK have morphed into virtual gags for those not parroting the government views. I understand - and agree with that position. But in a culture that is more protective of the right to free expression - this would not happen. So you make my point for me. Conservatives squawk about freedom - until it does not suit their purpose - and then they become the ones who want to trample peoples freedoms. The wider point - being supportive of government having a strong role in terms of health/safety/environment - does not mean one is opposed to the idea of a free society. In fact in can mean the person is more respectful of everyone's freedom - like the freedom to drink clean water. Onions during riot situations either you do what the police tell you to do or you get arrested. It is part of the public safety concerns. I do not have to explain how quickly things can get out of hand and lead to multiple deaths. You cannot gauge the seriousness of a situation by reading a liberal account of a liberal riot on a liberal site. So what? People have a right to free assembly, and free speech. If some people engage in violence - they should get arrested. Notice when the white supremacist drove his car into a crowd - they did not Kettle the protesters and arrest a big mob of people. But I have personally attended protests - that are protected by free speech in the society I want to belong to - and watched the police do their thing. It is not pretty. But still - the wider point is that I respect freedom more than you do - and yet you want to lecture me about freedom. Government involvement in issues like health/safety/environment - does not equate to a disregard for freedom - in fact just the opposite. Onions if you want to read about a real case where a US government agency violates a citizens rights here you go. Onions you are correct that there are plenty of cases where the US government violates a citizens rights. But contrary to your belief much of the violations are done by individual agencies enforcing laws in an over zealous or even criminal manner such as my last post. That is why conservatives think that less is better when it comes to laws and their interpretation. I always thought that if a prosecutor was proven to have manufactured evidence against a defendant in order to get a purposely unlawful conviction or if he purposely withheld evidence that could exonerate the defendant the prosecutor should be charged with an equivalent crime and jailed if found guilty. "That is why conservatives think that less is better when it comes to laws and their interpretation." Then, why do you want to get between my wife and her doctor? Why the Republican Police State? More EVs? It may not matter because once the liberal-haters see how good our electric cars are, they will have them, too. We will trade in our 2015 VW e-Golf for something with more miles available in a month or so. The Tesla P 85 stays, and today we get analyzed for household Tesla batteries. We live in earthquake country, and want to be prepared. The future got here while Trump was fooling the goobers. Gkam that was a very good article in the NYT. They presented an unbiased view of the benefits and problems with EVs. Gkam do you mean liberal haters or people who hate liberals ? It made me laugh to see the liberals carry their "Love trumps hate" signs and then once he was elected display their unmitigated hatred of him and the people who elected hm. Their hypocrisy is beyond belief when they claim that Conservatives are the only ones displaying hatred. Who was marching with torches and chanting "Jews will not replace us!"? Let's get back to EVs. How many have you driven? I ask not from snark, but out of getting you to look into something you may like. It is the lack of maintenance which I love, and the filling up at home, and the fact they drive like sports cars with their very low center of mass and full torque at all speeds. Bottom line on many of these areas - is that no amount of delusional thinking will change reality. gkam is right - EV's are the future - as they are so superior in many ways. I used to have a Leaf, and recently got to ride in a model S. Can't wait till my 12 year old civic croaks - and then we will get the next EV. GKAM I actually like electric vehicles and believe, like you, they are the future. Just don't legislate them into my life and don't ask me the pay for other people's 100K Teslas. EVs pretty much go hand in hand with autonomous vehicles which will revolutionize the way that vehicles are utilized. greenie, I find myself snickering when I see a Maserati or super Porsche or other racer which needs its own mechanic. I don't even need to show them they can't keep up with an electric P 85. "I don't even need to show them they can't keep up with an electric P 85." You are correct if talking about a pure 1/4 mi drag race. Has anyone raced a Tesla against other performance cars say 20 laps on a real road course like Le Mans? Not doubting, just asking. "No one is forcing you." No eh! What are proposals to ban fossil fueled cars? What is a carbon tax? What is this whole article about? But still - no one is forcing you to buy an EV - free world right? "Has anyone raced a Tesla against other performance cars say 20 laps on a real road course like Le Mans? Not doubting, just asking." And I am not saying because I do not know. It would be interesting. It is a heavy car, but sure-footed. The new roadster would be the challenge with an alleged 600-mile battery and/or an under 2-second 0-60. They sure are planning to force me. Nope - they are just banning oil burners. You can still walk, bicycle, drive a fuel cell, use public transportation, stay home, or move to a different state. Plenty of options for you. If the people of California want to ban oil burners - surely that is their right - or are you the only one who has the right to decide stuff? Onions your last reply is so disingenuous it makes me cringe. "Onions your last reply is so disingenuous it makes me cringe." Here you go, . . . The gov of California will not ban gas-powered cars outright,.... they will make use of social engineering to coerce the behaviour of the public. This is a direct affront to personal liberty, which does not phase the liberal progressive, and which is why the liberal progressive is more of a threat than AGW. There are economic forces at play in a free society that no centralized gov is competent to control without devastating consequences, i.e. the housing market collapse reverberated across the planet. The technology has to be desired by the masses, it has to compete and win for economic integrity. Stupid liberals rely on artificial realities and efforts that operate counter to human egoism,.. ensuring the failure of their ideology. How many EVs do you have? We have two now. The first one saved us $3000/year in gasoline alone, not counting all the oil changes and tuneups ICE cars need, which we do not. Since we have PV, all of our household electricity and power for both cars is free. The payback for the PV system is less than four years. When others shed their political prejudice and get them, I hope they think of us (the liberals), who had them for years, and tried to tell them. I don't mind the idea of alternatives to ICE, and next time i'm in the market for a vehicle I would research them out and compare w/battery replacement cost, etc. I won't thank any liberal who desires to impose upon me a choice that should otherwise be made within a free market,....... because technology needs to be economically stress-tested in order to be a long term viable solution. It's not enough to take pot-head liberals word for it. Liberal : One who is capable of independent thought. Conservative: A fearful person who prefers to cower in delusion rather than face reality, and seeks out the echo chambers that enable said delusions. I won't thank any liberal who desires to impose upon me a choice that should otherwise be made within a free market,....."
"A new study finds 6.5% of global GDP goes to subsidizing dirty fossil fuels"
That is $5,000,000,000,000 each year! From a convoluted study that can only come from bias. But Yea, lets get rid of subsidies for oil/coal,...... and alternatives as well? I would prefer massive funding of energy technology research. Right, because one who invents their own definitions isn't 'cowering in delusion'? When I reference liberal ideology, it isn't emotional drivel as you just displayed,.... it is there own admitted political philosophy. If you think conservative ideology means 'one who is reluctant to change', then you willfully ignorant of political philosophy. ..... one who advocates for free market capitalism in an arena of liberty is one who advocates for constant change and economic evolution,..... whereas one who desires control of this natural force, fears it. Edit: '[their] own admitted political philosophy'. Gee, the subsidies thing was really big with conservatives until they found out about the ones for oil and gas. With my PV system, I actually subsidize the utility as well as producing my power. I would think that you would want alternative energy companies to lobby for subsidies? No? It's not that there is something special about oil/coal over and above that it happens to be the dominant energy source at present,..... iow, I sure we conservatives would just as assume profit from alternatives and lobby on their behalf. Btw, how much CO2 is caused during the manufacture of electric cars / batteries? How many miles ICE equivalent is that? "Liberal : One who is capable of independent thought." Yea, that is why they always need the force of a government edict in order to carry our their plans. "Btw, how much CO2 is caused during the manufacture of electric cars / batteries? How many miles ICE equivalent is that?" Thank you, I was waiting for someone to ask that. Well, let's look at the difference between machining the hundreds of parts for an ICE with the simple coils of an electric motor. How much energy involved in the melting of metal for the the engine block and the other parts? How many times have you had to change the oil on your refrigerator motor? Valve job? Clean the injectors? Electric motors run essentially forever. That difference in maintenance and operating cost will kill the ICE. Well I know that this is not indicative of all EVs but it appears that even a small sheet metal dent in a Tesla can amount to a $30,000 repair bill. Here is just one example. I asked you about the CO2 cost of electric vehicles and you told me about ICE vehicles. Well, let's look at the difference between machining the hundreds of parts for an ICE with the simple coils of an electric motor. How much energy involved in the melting of metal for the the engine block and the other parts? Do those ICE manufacturers plants still run off coal or steam or animal power,..... or do they run off the same stuff as the charging stations for electric vehicles? Here is the answer,.... roughly eight years of ICE driving,.... and by then it's almost time for a new battery,.... by which I mean, a new electric car. Nuom, if you do not understand the rest of it I will spell it out for you. I told you some of the differences between the powertrains because that is the only difference between the two. The bodies and other parts re the same. I did not include the transmissions, which the EV do not have. I did not include the emissions systems which the ICE must have. Shall I go on? "even a small sheet metal dent in a Tesla can amount to a $30,000 repair bill. Here is just one example." Did you really post that? Why? For one, it is false. The cost of repairing the side of a $100,000 aluminum high-end car was $9600, not $30,000. Compare that to a Maserati of the same value and vintage. Read the comments and see the other posts.
" January 31, 2016 I have had two similar repairs, one cost $1300 the other $2400. I would suggest that due diligence would mean getting competitive bids before posting inflamitory headlines." BTW, I bought a used Tesla Model S, P 85 which looks brand new, and cost about half of the original price in 2013. It had only 23,000 miles because the other owner had it before charging stations were installed, and it was not yet practical. Now it is both practical and exciting. When it got some condensation in the inner taillights, Tesla sent someone over and repaired it in my driveway, updating some trim and replacing entire assemblies. I expected to have to sell the VW e-Golf to pay for it, but there was no charge. The technician said the new gaskets were better than the originals. I am a liar eh Gkam. That is not what I said. And the article proves you wrong about the real cost. The easiest way is to stop subsidising Oil. In Europe and other areas it's $8-12 a gallon. Then you don't need any incentives or deals. Just get the TRUE price and FACTS out there and it's normal progress.